Australian Institute of Architects nominates top buildings from across the country to recognise advances in design. From England to Thailand, this year’s shortlisted projects in the category of “International Architecture” are quite diverse, and yet all of them focus on the theme of regeneration within the built environment. You can think of regeneration as being defined by injecting a sense of renewal to a particular physical site, whether it’s by the water or in the jungle. Architecture as a regenerative force not only defines a place but it provides a fresh perspective on the surrounding environment. More importantly, each building in this list resuscitates pre-existing conditions in each country from across the globe and contributes something insightful to its respective cultural context. BVN Donovan Hill’s project (below) in New Zealand rejuvenates the once-ailing Auckland waterfront with its design for an ASB bank headquarters in the Wynard quarters of North Wharf. ASB North Wharf, New Zealand, by BVN Donovan Hill. AIA[/caption]High-tech innovation meets commercial office in the façade design, with yellow extruded windows bursting through a sunscreen of fluttering tree “leaves” amidst bold signage. Capped with an aluminium toque, this building meets the urban challenge of redeveloping a future workplace by the water’s edge. 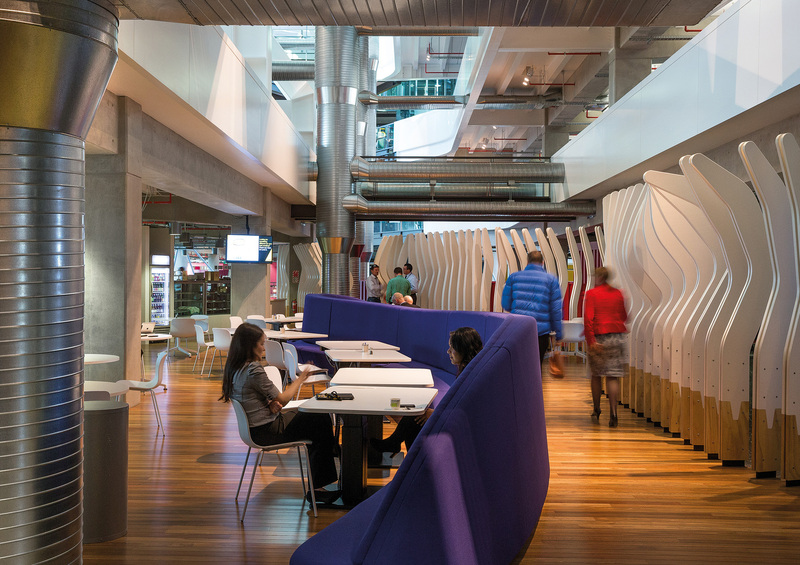 tour the ASB bank through Google Maps or Google Earth and virtually stroll through the turquoise teardrop-shaped conference rooms. WOHA’s boutique ParkRoyal on Pickering Street (below) in Singapore presents itself a sustainable “hotel in a garden”. Its three glass towers enclose wave-like shelves of vegetation including frangipani and palm trees coupled with infinity pools. The bold layout of this building allows for twice as much growing space for greenery against the rather generic skyline of Singapore. The hotel doubles as a public landmark with its notable undulating topography of pre-cast concrete. Through the hotel’s solar cells to power lighting and automatic sensors to monitor energy and water usage, the ParkRoyal brand has kept its promise to create a local connection between its guests and the environment. Marra + Yeh Architects provides tasteful accommodations for the members of a forestry company that oversees the stewardship of the surrounding land. Using a modular system, the shelter in the rainforest employs thoughtful timber sections re-using local materials in its verandah. 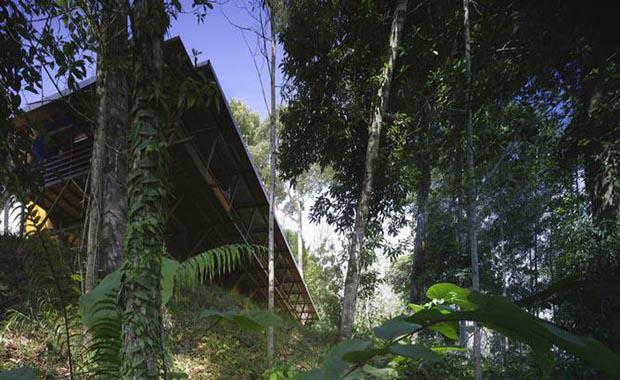 Its collection of rainwater and its modest footprint contribute a sustainable approach to a hidden patch of jungle. More subtle in presence, the shelter embodies a variation of vernacular architecture that relies on clean, open spaces and the interplay between light, air, and shade. Denton Corker Marshall demonstrates a respectful approach to the ancient henge monument that sits alone in a windswept plain. The visitor’s experience, in fact, is always conditioned by the historicity of the megaliths. 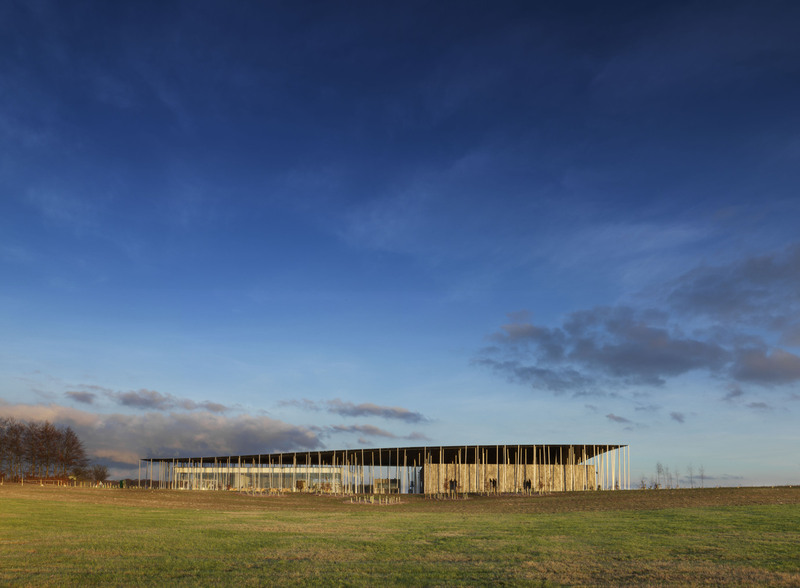 Barrie Marshall, principal director responsible for the design, told me: the Visitor Centre makes no visual reference to the Stones – it is expressed as a transient place, not as a destination in itself. It is simple yet distinctive; an undulating perforated and lightweight canopy echoing the rolling landscape, and supported by a sapling grove of fine steel columns. One of the toughest challenges for Denton Corker Marshall was to choose an allocated site on World Heritage land, which required little to minimal excavation. As a solution to an architectural dilemma, the centre is placed at a far distance from the stones, summoning transience and fineness. Kerry Hill Architects’ Sukhothai Residences appears as a peaceful respite from the ongoings of urban life in Bangkok. Complete with reflective pool and views over the city, the modern design of 196 condominiums allows tenants to recharge their batteries in a comfortable luxurious setting. The 100m pool faces a cultivated bamboo forest cut into a straight hedge enclosing the property, whose features are highlighted by a “floating pavilion” covered in alternating white panels. While remaining a private dwelling, the Sukhothai Residences are not simply for its tenants but also for the curious eyes of tourists to the Thai capital who wish to see excellent design. All of these striking buildings are exemplary in their own right, and each of them tackles the difficult unification of clients’ private interests, public space, and greater positioning in the urban fabric or natural realm. Contemporary architecture is now expected to meet the demanding needs of society while respecting the integrity of nature. In this vein, these five buildings successfully balance these requirements with subtle and emphatic poise and bring these words to mind: restore, renew, and revitalise. Certainly these are the current terms to live and design by, bringing new visions to life in different parts of the world. Read further analysis of the 2014 National Architecture Awards.